Elizabeth Zimmermann started Elizabeth Zimmermann, Ltd (now Schoolhouse Press) in 1958 with a one-page knitting newsletter that included a pattern. In 1969, she expanded to the Wool Gathering booklet that includes a pattern and book reviews. Meg Swansen, a master knitter and Elizabeth's daughter, continues the Wool Gathering tradition. 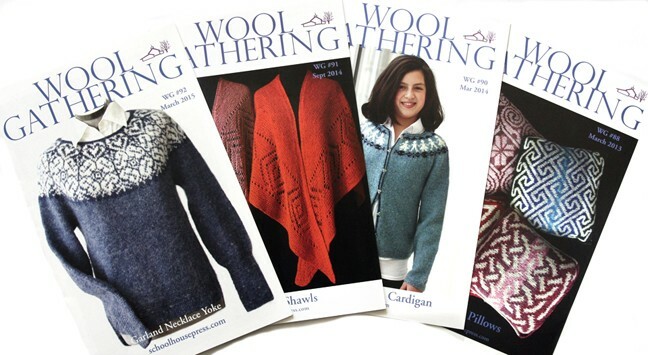 A Wool Gathering subscription includes 4 issues, beginning with the most recent issue (if still in stock) or upcoming issue, over two years, one mailed in fall (September) and one mailed in spring (March). Each issue includes an original design by Schoolhouse Press designers, primarily Meg Swansen or Cully Swansen, brief reviews of new books and products, and sometimes additional commentary about knitting. Wool Gathering subscriptions are currently available in print format, with a coupon code to download the digital version for free. International subscription $25 for four issues and free shipping on this product. Wool Gathering back issues are available. When they go out of print, they will be made available as expanded Schoolhouse Press Patterns. Note: Issues pictured in image are only representative of the subscription. You will not receive those issues as part of the subscription.